Hambleden is a large parish, compared to its neighbours. It covers 26.93 sq km (10.4 sq miles, 2,693 hectares, 6,655 acres). The 2011 Census records 641 dwellings (of which 92 are listed) and 1,445 usual residents. The parish is situated in the southern part of the Chilterns within the district of Wycombe between the towns of Henley and Marlow. 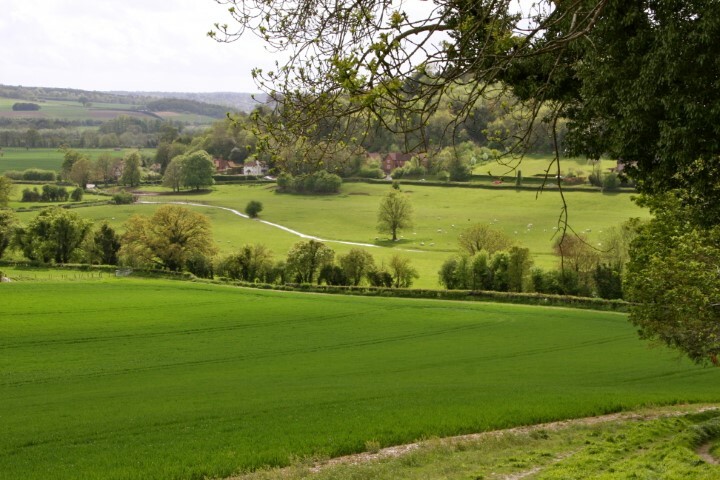 Its southern boundary is marked by the River Thames and it extends northwards up the Hambleden Valley including the higher ground to the west and east. One of the globally important Chilterns chalk streams, known locally as ‘The Brook’, flows for 4 miles along the valley – although, due to fluctuations in the level of water table, it does dry up periodically (increasingly so in recent years). The parish is entirely rural and lies within the Chilterns Area of Outstanding Natural Beauty. The underlying rock is chalk with loamy floodplain soils along the valley bottom, shallow lime-rich soils overlying the slopes and with more clay-rich soils on the hill tops. The parish supports both arable and livestock farming and there is also extensive woodland cover, predominately of beech, which is managed for timber and the rearing of game birds. Most of the land is in the ownership of estates, the largest of which is the Culden Faw Estate, although there are also some independently owned farms. The area is renowned for its rolling hills and extensive network of footpaths and bridleways which are frequented both by locals and visitors alike, often with their dogs in tow. Horse-riding and cycling are also popular. The parish is traversed by three long-distance paths: the Thames Path, the Chiltern Way and the Shakespeare Way. Although there is a regular bus service along the Henley-Marlow road with bus stops at Mill End, there is no other public transport and nearly every resident is, of necessity, a car owner. Broadband Internet has only recently come to the valley and still does not reach all houses. Mobile telephone coverage is patchy.Hambleden, Frieth and Fingest each have Church of England churches, the church in Fingest dating back to medieval times. The local Church of England primary school in Frieth currently has 120 pupils and regularly sends children on to the excellent Buckinghamshire secondary schools. There are five public houses, a post office in the general stores in Hambleden, a doctor's surgery in Hambleden, village halls in Frieth, Skirmett and Hambleden, one garage in Hambleden for car maintenance (but no longer serves fuel!). Hambleden also has a an active sports club with football, tennis and cricket. There are a large number of people who have lived in the villages all their lives and others that have moved into the area because of it's unspoilt beauty. Prices of property are extremely high which sadly means that younger people who wish to get onto the bottom rung of the property ladder have to move out of the area where they were born. The Parish Council has been instrumental in having 9 houses built on the edge of the village to be rented or part bought by local people.